Currently in India, there are over 200,000 researchers working on numerous applications to better understand diseases and advance drug discovery. To support their discoveries, we are thrilled to announce the opening of the OpenSPR Centre of Excellence in Bangalore, India! Nicoya has designated the Institute for Stem Cell Biology and Regenerative Medicine (InStem) as the new OpenSPR Centre of Excellence in collaboration with Dr. Ramaswamy (Senior Professor at InStem) and his lab. 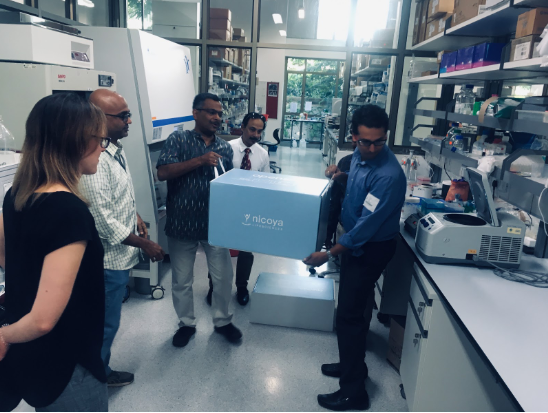 During our visit to the National Centre for Biological Sciences (NCBS) where InStem is located, our VP of Product Success, Sarah Strathearn, and our VP of Business Development & International Sales, Jim Harp, were invited to host a two-day workshop titled “Uncover your Binding Kinetics with OpenSPR”. The event was held in Dr. Ramaswamy’s (often referred to Dr. Rams) lab and hosted over 20 leading researchers from several institutions across the country. The workshop focused on the importance of measuring kinetics for characterizing binding interactions and demonstrated how our user-friendly, benchtop surface plasmon resonance (SPR) technology enables researchers to obtain real-time binding kinetics and affinity data. Additionally, the workshop included in-depth training for SPR experimental design and optimization, as well as hands-on experience with the OpenSPR, examining kinetic interactions with proteins, peptides, sugars and small molecules. With the opening of the OpenSPR Centre of Excellence in India, we are furthering scientific research and innovation globally by partnering up with international distributors, institutions, and researchers with missions alike. 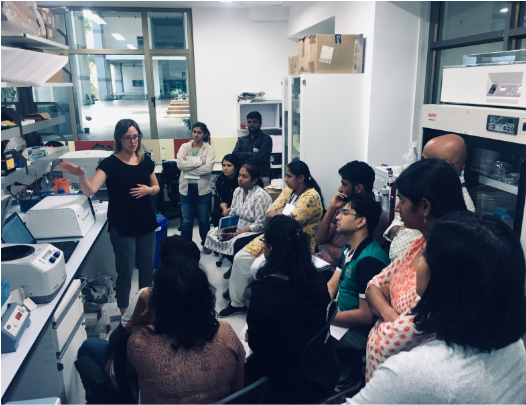 In addition to our collaboration with researchers in India, we are currently helping scientists in more than 30 countries get the high-quality binding data they need to accelerate their research! Nicoya’s VP of Product Success, Sarah Strathearn, leading the “Uncover your Binding Kinetics with OpenSPR” workshop. How are scientists in India accelerating their research with OpenSPR? In India, NCBS, InStem, and the Centre for Cellular and Molecular Platforms (C-CAMP) are referred to as the “Bangalore Biocluster” because they share tools and resources to accelerate discoveries in science research. Similar to our mission at Nicoya, C-CAMP aims to provide researchers with tools to encourage science and entrepreneurship through innovative training, services, and state-of-the-art technology. Similarly at InStem, researchers are dedicated to breaking boundaries in stem cell research while collaborating with labs and scientists to advance their discoveries. Nicoya’s OpenSPR is now one of the accessible, innovative technologies at these leading institutions. As benchtop SPR becomes increasingly accessible in India, more researchers can get the high-quality data they need to accelerate their research. Dr. Rams unboxing his new OpenSPR at the Institute for Stem Cell Biology and Regenerative Medicine (InStem). How is OpenSPR accelerating Dr. Rams’ research? Along with being a Senior Professor at InStem, Dr. Rams is well known for being the co-founder and first CEO of C-CAMP. With over 100 publications to date, he is also known for his continuous research in understanding biological function at atomic resolution. More specifically, Dr. Rams’ laboratory has been dedicated to uncovering drug targets against bacteria that cause sepsis through the research of sugars and their functions. Dr. Rams is also famously known for leading the research on the benefits of cockroach milk (yes, you read that right!). His research suggests that cockroach milk is four times more nutritious than cow’s milk and could very easily be the next big superfood. This development deservingly received much attention worldwide following the 2016 publication. In more recent projects, Dr. Rams and his team are currently integrating the OpenSPR to compliment the ITC in their lab and accelerate their research further. OpenSPR will verify their ITC results for the affinity of interactions and uncover the kon, koff and KD of the interactions. Having an OpenSPR has enabled Dr. Rams’ lab to advance their highly innovative research without compensating their data quality and research time. How can researchers in India get access to benchtop SPR? Nicoya’s OpenSPR is being used to advance and innovate research all over the world. With the help of our international distributors, we are building a collaborative community of innovative researchers. If you are wondering how you can get OpenSPR on your lab bench in India, our distributor , Rajesh Nair, and his team of OpenSPR experts at Basil Biosolutions would be thrilled to chat about how OpenSPR can solve your toughest research challenges. Get started here with all your OpenSPR inquiries.